Today Mary Grace is alive and well - thanks to you! Fr. Alexander Kobesi is well known to you all. His stirring search for a church building on Bali, as well as the faith of his parishioners, inspired you to provide the necessary funds for our mission in Bali to begin regular services. With great enthusiasm, both Fr. Alexander and his parishioners plunged ahead in their eagerness to worship God and spread the Gospel of Christ. We Orthodox know that no such good deed goes without a challenge from the forces of darkness. You all have seen how your own priests’ families are the first to bear the brunt of demonic attacks and temptations. Bali’s only Orthodox priest was no exception. In April, Fr. Alexander’s sixteen-year-old daughter Mary Grace got into an accident on her moped. She hit her face and head on the pavement, breaking teeth and causing serious bruising. It was immediately obvious that she needed medical treatment, but her father couldn’t afford it. To make matters worse, in Bali, a doctor will not treat you unless you pay up front! 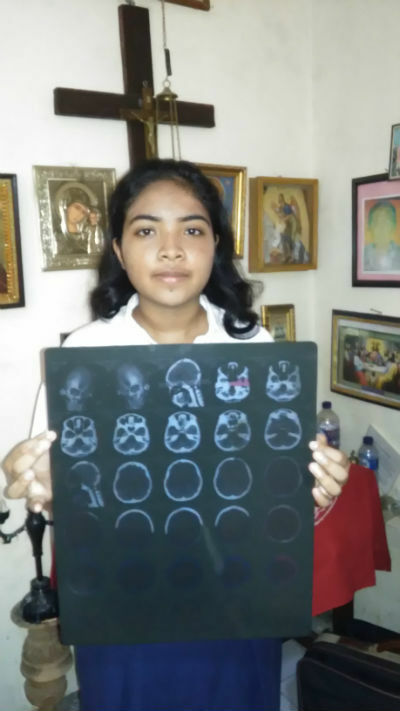 The cost for a CT scan was prohibitive for the young Orthodox mission. So the FFA immediately put out an appeal. Your generosity, as always, overwhelmed us. You ensured that Mary Grace got to a doctor in time. Then, you went above and beyond the minimum. Not only did you raise the necessary $450.00 for Mary Grace’s treatment, you all raised over 7,000.00, all of which went to the daily needs of the mission and Mary Grace’s continued treatment. Now, in addition to the extended treatment for her brain trauma, you made it possible for Mary Grace to have two broken teeth fixed. And, more importantly, you gave comfort to a priest who tirelessly works to provide comfort for others, leaving none for himself. "With all humility we extend our gratitude to you all for the news that really strengthens us. This is a miracle of God. God is love; in fact God has shown love and kindness through you. In a short time, you raised so many funds! Last night our family prayed and thanked God and remembered your kindness and the benefactors." We hope you will continue to remember this worthy family as they continue to spread the light of the Truth in a land darkened by radical Islam and materialism.